Visually different from most of its contemporaries, and totally different from every other Volvo car. The Volvo PV36, perhaps better known as the Carioca, is an exciting chapter in the Volvo history. It is also quite famous in automotive history if you consider how few examples were actually built and by such a small manufacturer like Volvo Car Corporation. 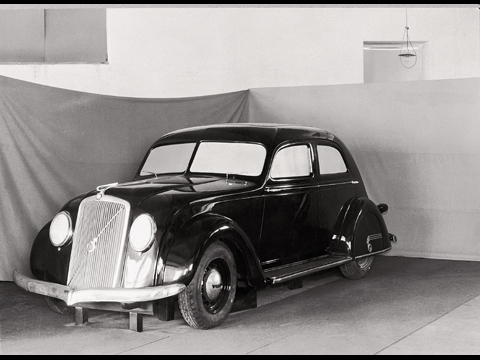 In 2010 the PV36 celebrates its 75th anniversary - and let us right from the beginning state: It is not a copy of the Chrysler Airflow which it has been accused of. 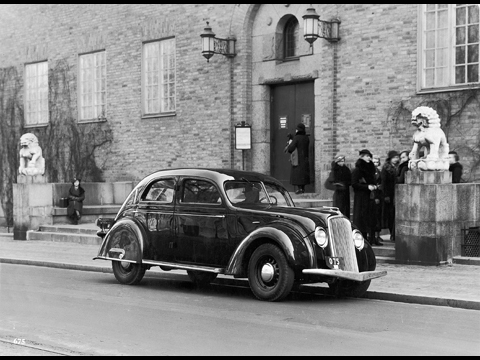 In 1933, however, Volvo did show a streamline car, but afraid of the reactions of the public used a private person as responsible front figure - Gustaf L-M Ericsson of telephone company fame. Ericsson was named designer of the car and the project was his brainchild. "Venus Bilo" used a Volvo 655 chassis and had a full-width body with a front not unlike that of the Hupmobile Aerodynamic a year later. Its smooth shape was rounded at the rear with the spare wheel slotted in horizontally and acting as rear bumper. The idea of the car was to cut fuel consumption and prevent the creation of swirling road dust by using a streamlined body with a fully covered underside. Interesting and daring it was a prototype and as such it stayed, disappearing in the 1950s. To conceive, design, style and manufacture a car takes a lot of time and effort today, and did so also in the 1930s. To proceed from idea via drawings and scale models to a real car with all that is needed in terms of tools, components and production development, is a process that takes several years. Ivan Örnberg moved back to Sweden in 1931. At that time neither Hupmobile - where he worked as an engineer - nor Chrysler had come very far with their streamline plans. Hupmobile not at all in fact, because they only got started in 1932 when Raymond Loewy** - maybe the most famous of all industrial designers and automobile stylists in automotive history - was hired by the company in order to boost sales of the slow-selling cars. At the beginning of 1934, the Hupmobile Aerodynamic was presented. From the windscreen and forward it had a certain plough like streamline shape, but the rest of it was rather conventional. It was good-looking though without any particular individuality. It had a fully-pressed steel body, including the entire roof, fitted to a separate frame and was from a technical standpoint not in any way extreme. Extreme, however, describes the definitely more daringly styled Chrysler Airflow - and its cheaper sister car De Soto Airflow - that arrived during the spring of 1934. They had a one-piece rounded front or face, a grille that looked like a waterfall and low-positioned faired-in headlamps. 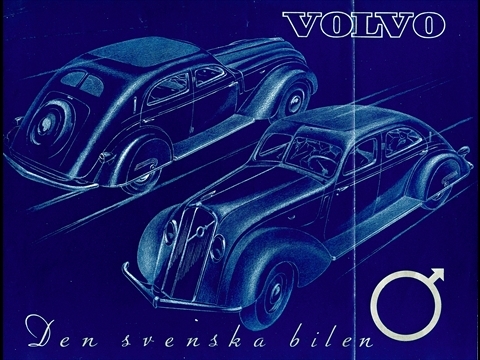 But, the Volvo PV36 had a technical upper hand over both the Hupp and the Chrysler, unfortunately not to be seen from the outside but felt when driving: it used an independent front suspension - with the front wheels moving independently of each other during vertical movements - which greatly improved handling and ride as opposed to a beam axle. It is in fact the position and look of the headlamps that really make this car what it is, and remind the observer of the Chrysler Airflow. But calling the Carioca a copy cat would be wrong. The differences are too big and too many between these cars. And regarding the Hupmobile, there is virtually no resemblance at all. The front bumpers of the Volvo and the Hupmobile have been said to be identical. Far from it. Indeed, both are V-shaped but the one on the Volvo is not so pronounced while the Hupmobile one has a sharper angle and follows the wing shape in a more elaborated way. The bumpers may, however, have been made by the same supplier but to different specifications. The Chrysler/De Soto bumper is completely different. Nothing there at all. Of course all this new thinking could not come cheap. The price for the PV36 at the time of its introduction was SEK 8,500**** - 1,000 more than the De Soto Airflow and 1,000 less than the more exclusive Chrysler - which disqualified most car buyers straight away. Secondly, the high price in conjunction with the looks of the car scared off the potential Volvo buyers who could afford a Volvo but also wanted a Volvo to look like one. 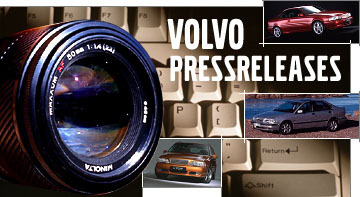 Other Volvo models at the time were priced between SEK 5,000 and 6,000. For the same price as the PV36, you could buy an American Packard 120 straight-eight or a six cylinder German Wanderer W50, the mini Horch. Beautiful luxury cars both of them. No wonder sales of the PV36 were slow. The following year the price was considerably lowered. But why is the car called the Carioca, like the dance? It is actually not called Carioca but PV36. Carioca is only a nickname but it has persistently clung to the car during all these years and is maybe more known and used than the actual correct designation. The swinging Carioca was danced for the first time in the Hollywood motion picture "Flying down to Rio" from 1933 by Fred Astaire and Ginger Rogers, in their first movie appearance together. It is a very passionate dance from Central America where the foreheads of the dancing couple must touch now and then during the dance. Carioca is also the official nickname for a native Rio citizen. Because of the fact that Volvo's export to Brazil started very early, already in 1933, one can suppose that the name Carioca was used as a flirt with the Brazilian market in the sense that it would associate to the people of Rio rather than the dance. Some Cariocas did finally end up in Brazil. Gustaf Larson, one of the Volvo founders, drove one - it still exists in private hands in worn but original condition - and the Swedish police force bought eighteen patrol cars. Most PV36 customers were, however, according to the delivery book people who could afford a pricey car, people like company executives, industrialists, businessmen, lawyers, doctors etc. As for special commissions, not much happened. Only one single car with a convertible body, made by the Nordberg Coachbuilding Co in Stockholm, was built on the PV36 chassis and commissioned by a wealthy businessman. The car had a two-door body, painted in a two-tone colour scheme, where most of the original details had been kept except for the roof. It would have been most interesting to have seen the price-tag of this car at the time. Like many other high-class and exclusive cars in Sweden during these years it had a short life and was unfortunately scrapped after some years only. It may be interesting to know that fewer than 25 examples of the PV36 exist today, most of them in Sweden and in varying conditions. 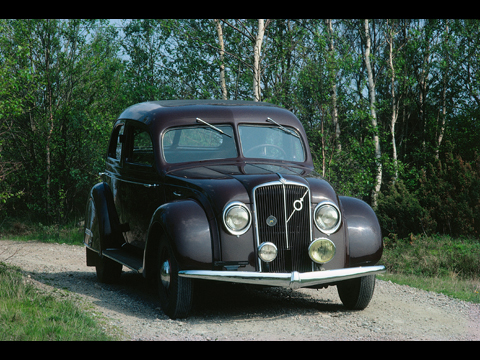 Just like the Hupp Motor Co and Chrysler Corporation, AB Volvo in Sweden also had to accept the sad fact that cars like these did not really have a market in the mid-1930s.They were twenty years ahead of their time with their streamlined and unconventional bodies. Car customers - and Volvo customers in particular - wanted conventional styling in harmony with the times, small visual changes. Hupmobile Aerodynamic is discontinued due to slow sales. Airflow is discontinued after four years of constantly sluggish sales. The last PV36 is sold, three years after its market intro. In total 500 cars and one bare chassis. Let us also once and for all on the 75th anniversary of the PV36 determine and agree that it is not a copy of the Chrysler Airflow. The Adler Autobahn which arrived in 1937, on the other hand, is more or less a miniature Airflow. The same front, the same profile, only slightly smaller.